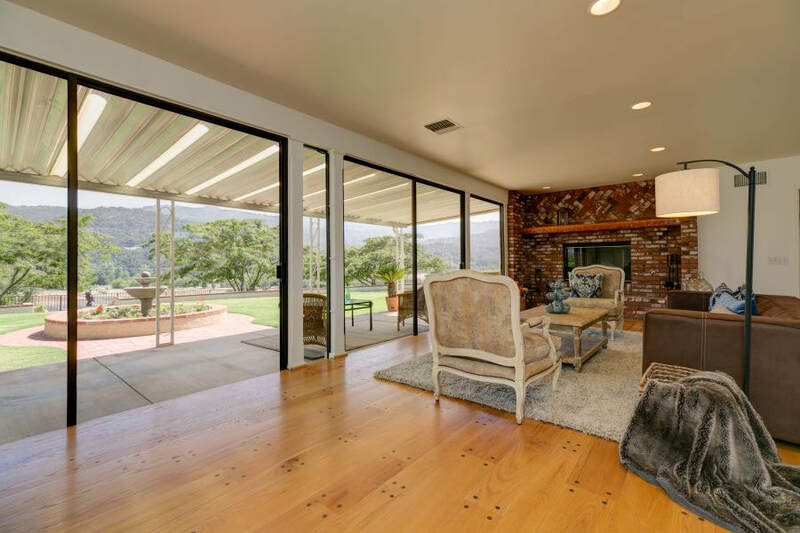 Tucked away behind a gated entry against the backdrop of the Topa Topa Mountains, this 36+ acre country retreat is just waiting for you to customize its many offerings to create your perfect weekend getaway, screenwriters’ workshop, corporate retreat, or semi-rural recording studio. 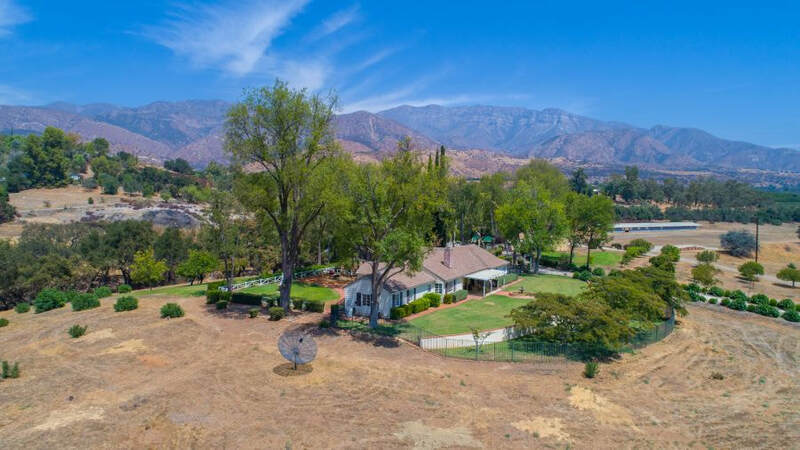 Whether you are looking for a full-time residence where you can enjoy country life in Upper Ojai or a weekend retreat where your family and friends can escape from the city, this versatile ranch has just about everything you might need to make this dream a reality. While it feels like you are miles away from the world on a private compound, Paradise Ranch is just 1.3 miles from Stagecoach Station General Store and Hardware for your everyday essentials. 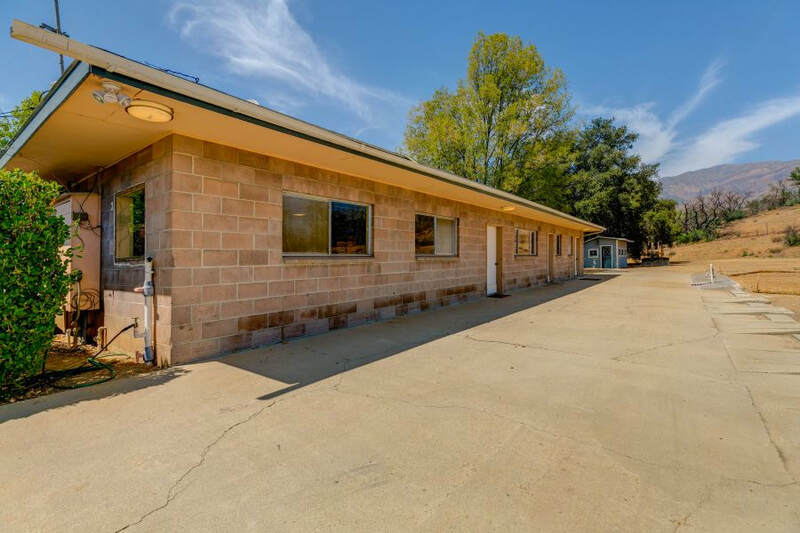 Just next door to the general store is the locally owned, roadside burger stand, The Summit Drive-In, where locals stop for some of the best burgers, fries and shakes in Ojai. As you head down Dennison Grade into Ojai, be sure to stop at the lookout for an amazing view of the valley below before reaching the bottom where you will find Ojai’s iconic Boccali’s Pizza & Pasta, which is just 3.9 miles from the ranch. In total, it will usually take you just about 10 minutes to drive from Paradise Ranch to the center of Ojai’s downtown village where you will find boutique shopping in The Arcade, outdoor concerts at Libbey Bowl, a weekly farmers market, the historic post office, restaurants, galleries, spas, salons, golf courses, wine tasting rooms, and events at the Ojai Art Center, which is the oldest, multi-purpose, non-profit art center in California. If you head east from the ranch, it will generally take you about 15 minutes to get to Santa Paula’s historic downtown with restaurants, shops and museums. For folks with private planes, Paradise Ranch is just 10 miles from Santa Paula Airport (SZP). And, of course, for the folks commuting to Burbank by car, it is only about a 65-mile drive. 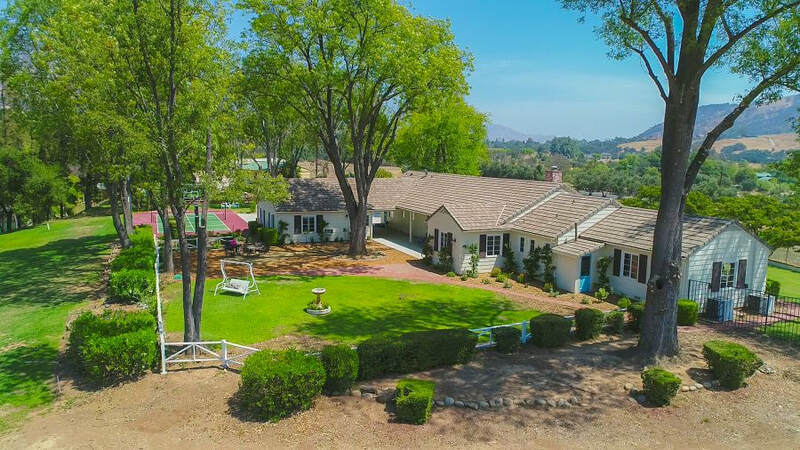 Beyond the gated entry and gate house, a well-manicured driveway delivers you to the approximately 4,000-square-foot farmhouse overlooking the ranch. Situated to maximize the views and allow proximity to the many amenities found at this country retreat, the farmhouse offers a three-bedroom, three-bathroom main home with one-bedroom, one-bathroom guest quarters separated from the main house by a breezeway. The large parking area ensures that your guests will have plenty of space to park at the house, plus, the four-car garage is just a short walk from here. In fact, all of the property’s amenities are easily accessible within a short walk of the farmhouse, including the saloon, rec building, sports courts, horseshoe pit, pond, barn, and workshop. The main entry into the farmhouse enters into a foyer that leads to the large living room, but the door you will be using on a daily basis leads from the breezeway into a large mudroom complete with built-in cabinets and shelves and a guest bathroom with a tile shower and tile floor. This shower just off the mudroom is going to be particularly handy if your plans for your new retreat include ranching or farming, or if you’d like to keep little feet from tracking dirt through the house after a long day of playing outside. The spacious kitchen is adjacent to the mudroom, which makes bringing in groceries quick and convenient. 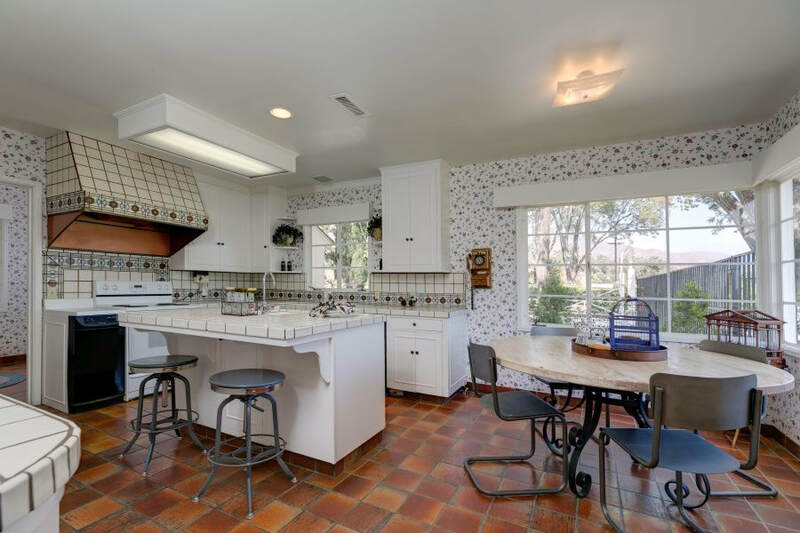 Once inside, you will find tile counters and backsplash, lots of work and storage space, a trash compactor, a large island with a sink and breakfast bar, a separate coffee station, and a three-basin sink where you can enjoy some amazing views while prepping meals. The breakfast nook is bathed in natural light from large windows that also allow for great views of the property and surrounding mountains. Plus, this kitchen has lots of character and really exudes a farmhouse feel. 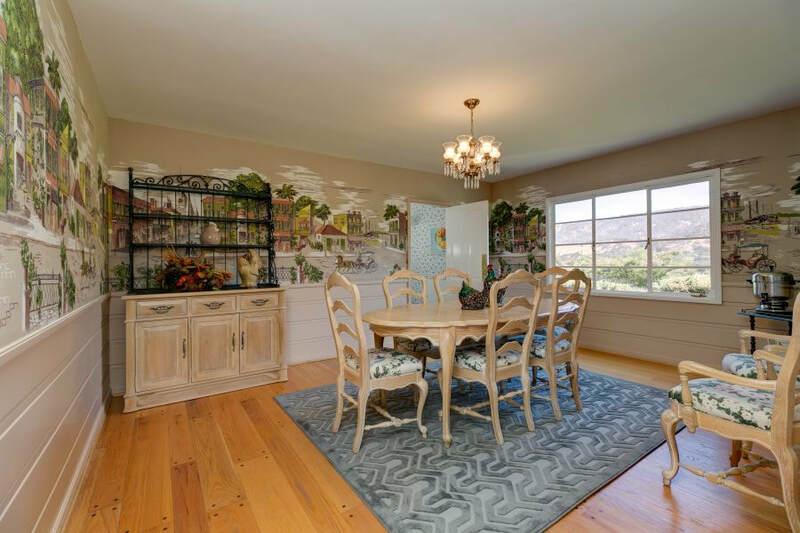 The formal dining room is adjacent to the kitchen and features a wood floor, built-in display shelves for grandma’s china and beadboard paneling to continue that farmhouse charm. This room also has a large window for natural light and mountain views. The wood floor continues into the huge living room where you will find plenty of room for an additional dining area, work space, game table, or multiple seating areas. The gas fireplace with a brick surround, brick hearth and rustic, wood mantel is the focal point, but it definitely has some tough competition with the large windows on one side of the room letting in natural light and mountain views and the gorgeous views on the other side of the room, which cannot be missed through the wall of windows with two sliding glass doors leading to a covered patio and lawn area with a fountain. The large alcove off the living room would make a great office or library with its built-in desk, cabinets and bookshelves. On the other side of the living room is the above-mentioned foyer, which has a coat closet and wood floor that continues down the hallway to the sleeping quarters. 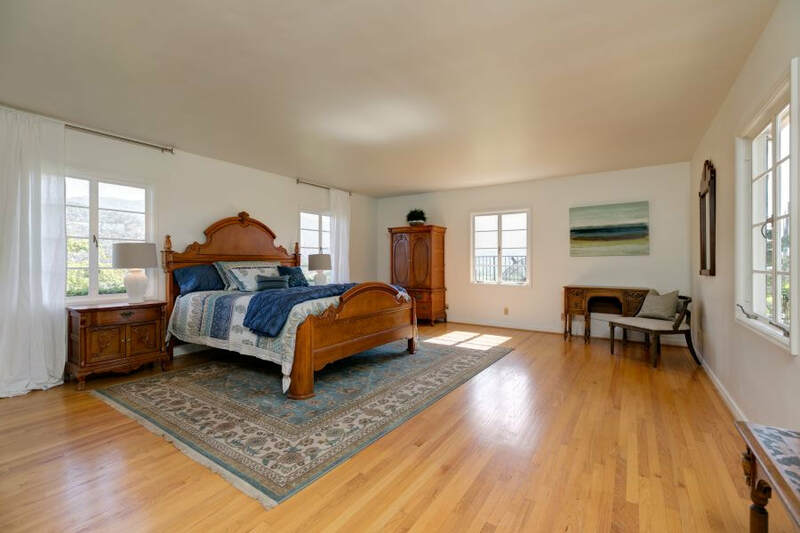 The first guest bedroom you come to has a walk-in closet and large windows for mountain and property views. The second guest bedroom also has a walk-in closet, as well as three windows looking out over some of the outdoor living areas. Since there are mountain views from every window, it is no surprise that even the guest bathroom offers some great views, along with a wonderfully vintage bathtub and sink, tile floor and bathtub surround, and a tile vanity. In the hall, you will also find a walk-in, cedar-lined closet, a linen cabinet and a small bonus room that could serve as a reading nook or craft room. At the end of the hall, the spacious master bedroom has windows on three walls to fully bathe the space in natural light and allow you to wake up to mountain views every morning. The en suite master bathroom has a tile floor and shower, separate bathtub, large vanity, and, of course, mountain views. In the space between the bedroom and bathroom, there is a dressing area with two closets, one of which is a walk-in closet with a built-in cabinet and drawers, and one of which is a large, reach-in closet with a built-in dresser and cabinet. 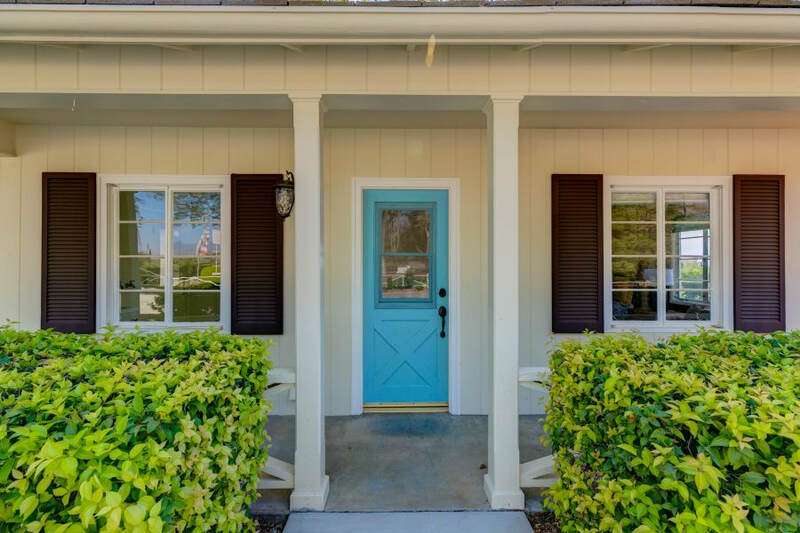 Located to serve both the main residence and the guest quarters, the large laundry room is situated between the two off the breezeway and has a sink, storage cabinets, tile floor, and enough space to also serve as a craft room or hobby shop. 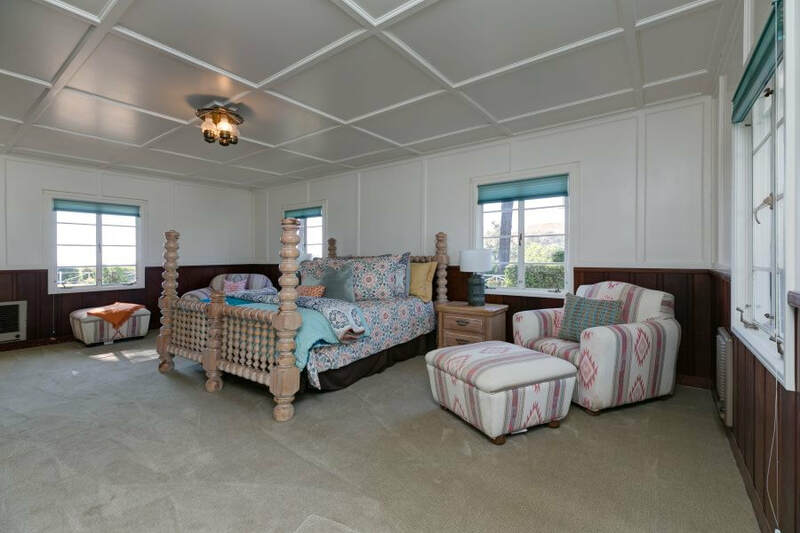 The spacious guest quarters are just steps away from the farmhouse with a covered porch, adjacent parking and easy access to the outdoor living areas, sports courts and other amenities. 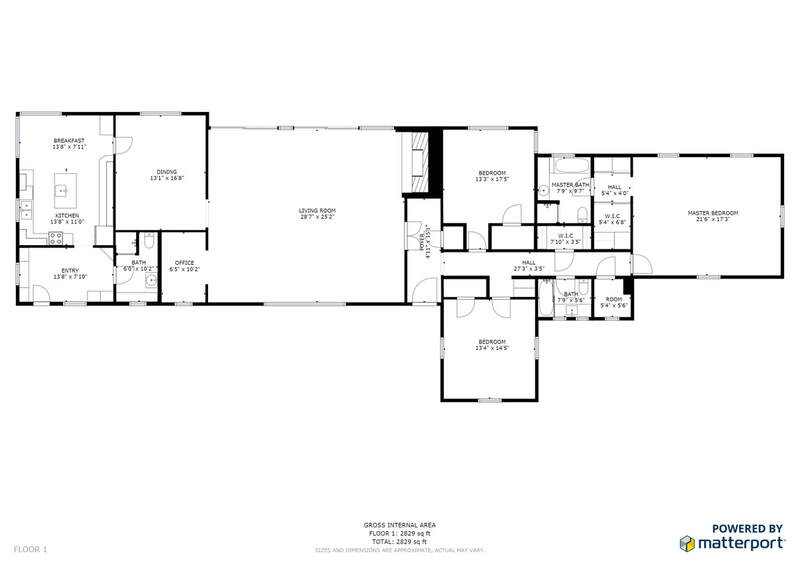 This separate space with a large main room, closet and bathroom could be used for maid’s quarters, short- or long-term guests, rental income, or comfortable quarters for an aging family member. The coffered ceiling and beadboard wall panels make this space incredibly charming and cozy, while lots of windows bring in natural light and gorgeous views. The en suite bathroom features a tile floor, vanity and shower, as well as a built-in storage cabinet and drawers. 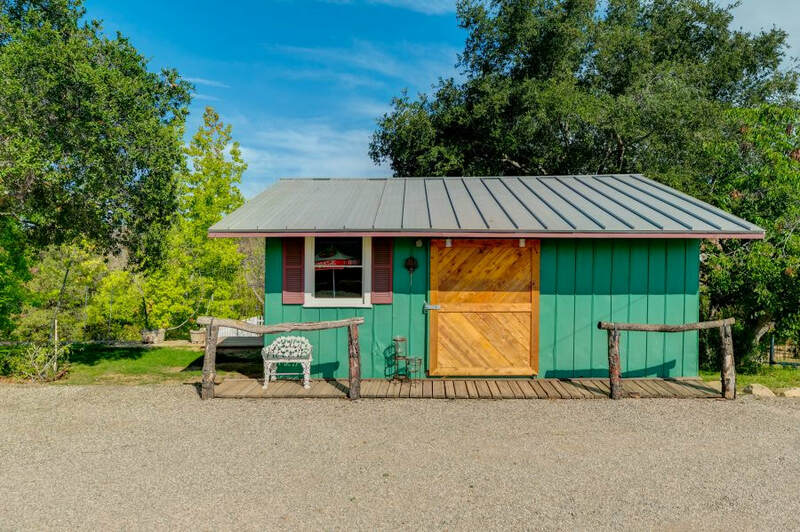 The gate house is a one-bedroom, one-bathroom cottage located just inside the security gate on this Upper Ojai ranch. 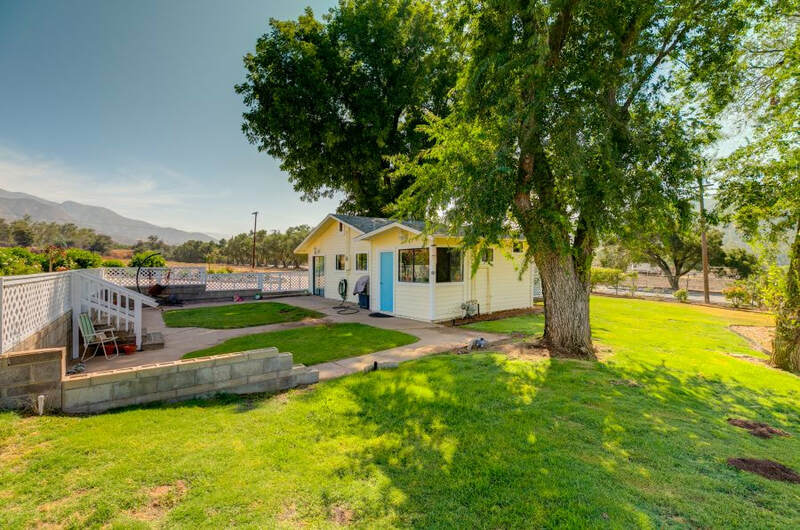 Separated from the main house and outdoor living areas by a long driveway, this quaint home could be used as a caretaker's house or a guest house, or it could be rented out for additional income. Inside the cottage, you will find a living room with built-in storage and space for seating and a dining table, tile floor and newer appliances in the kitchen, tile floor and tile surrounding the shower and bathtub in the bathroom, and a large laundry room with a tile floor and newer water heater. Sliding doors lead to a yard with a patio, mature trees and a large grassy area with steps leading to a second patio. Per the current owners, the gate house was a family-run gas station and store in the 1920s. This Old West saloon complete with hitching posts and a rustic, wood floor has us convinced that every ranch needs its own saloon. This is a great space for hanging out and entertaining friends and is spacious enough to use as an event venue. 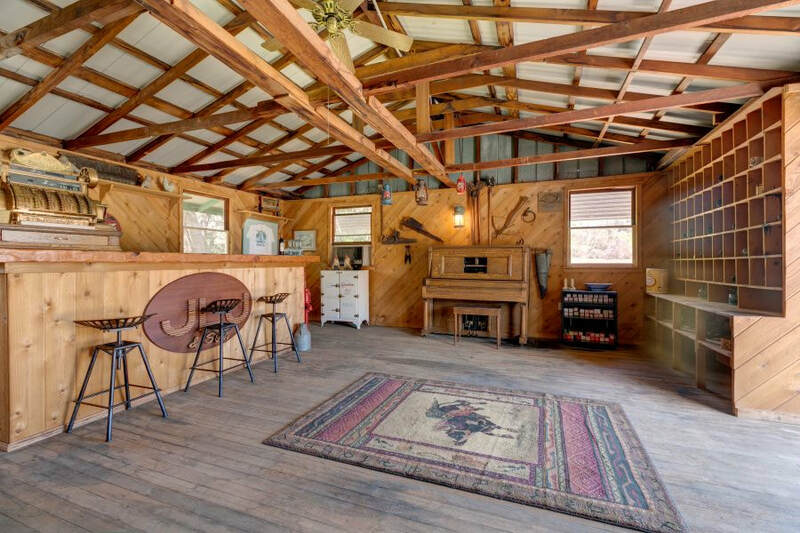 Step onto the wood porch and slide open the barn door to reveal exposed beams and rafters, a wooden bar, built-in shelves, wood walls, a ceiling fan and plenty of Old West appeal. Just behind the saloon, there is a deck overlooking the pond, and the horseshoe pit, shuffleboard court and pond are just a short walk away. The large, gravel area in front of the saloon could be used as a parking area for events or retreats, or could simply be outdoor space for your guests to gather while enjoying your private saloon. If you are looking at Paradise Ranch as a corporate retreat or screenwriters’ retreat, this would be a great space for work groups to meet or to blow off steam after a day of workshops. Just steps away from the saloon is the two-room rec building, which has a full kitchen and a bathroom with a tile floor and tile shower. The bathroom has both an interior and exterior door to allow guests enjoying the saloon or rec building access to the loo. There are two large rooms in this building, which greatly add to its versatility. The larger of the two rooms has plenty of space for multiple breakout groups, arcade games and table games, large yoga classes or meditation groups, or could be transformed into a recording studio with plenty of room for the entire crew to hang out, enjoy the great views and even make meals. The second room is also large enough for workshops or a rec room or could be transformed into a media room. 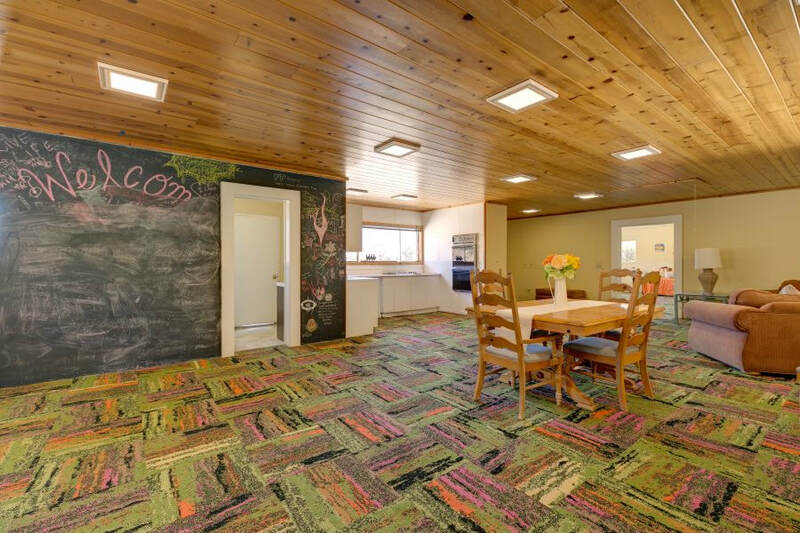 There is a chalkboard wall for brainstorming or keeping the kids busy, a door to the attached carport, and a large, concrete area at the front of the building that could be used for outdoor seating or activities. This Upper Ojai country retreat was designed for outdoor living. 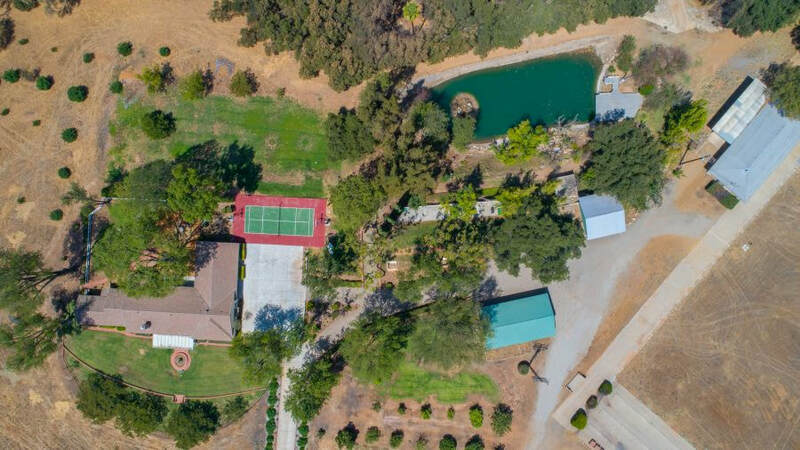 From the multi-use sports court to the large deck overlooking the pond, you and your guests will never be without something fun to do while on this ranch. The outdoor living areas begin with the covered patio off of the living room where you can enjoy the mountain views and the soothing sounds of trickling water from the fountain. A large, grassy area surrounds the patio with plenty of space for kids or dogs to play or for other outdoor activities. On the other side of the house, there is a covered front porch and another large lawn with dedicated seating areas. 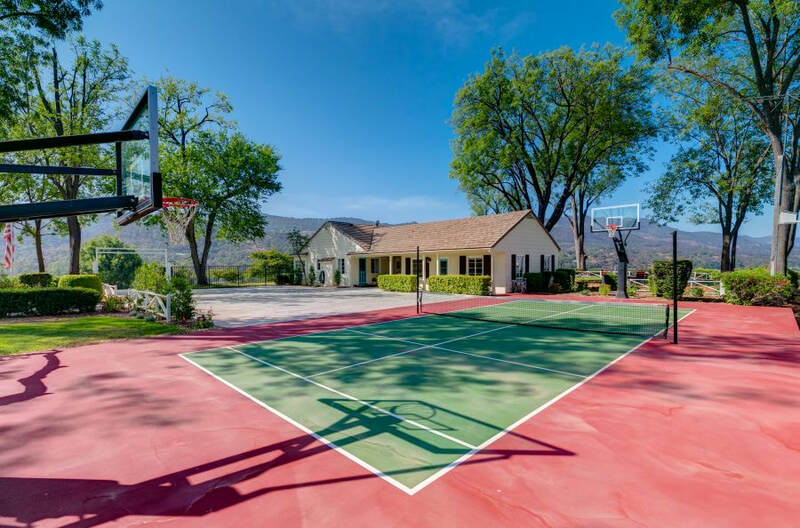 Just beyond this space, you will find the multi-use sports court with adjustable nets and hoops for multiple sports, such as basketball, pickleball, volleyball, and badminton. Meander just a bit farther and you will find a shuffleboard court, horseshoe pit, and plenty of landscaped space for reading, picnicking, or just hanging out under the mature trees. The saloon is just beyond this outdoor living area and has a fenced deck overlooking the gorgeous pond. Your guests can reach the pond by traversing one of the walking paths or by driving down around the rec building. A path allows for leisurely walks around the perimeter enjoying the waterfalls, while a large deck overlooking the pond allows for entertaining or sunbathing. Don’t forget to tell them to keep an eye out for the resident bullfrog, Jeremiah! There is also a seasonal creek behind the pond, a (second) seasonal pond with a waterfall, oak groves scattered throughout the property and a family orchard where you can pick your own fruit for healthy snacks and fresh juices. You will notice lots of well-maintained landscaping along the driveways, roads and walkways, as well as around the outdoor living areas. These landscaped areas are on automatic irrigation systems to conserve water and make watering more convenient. Aside from the above-mentioned saloon and rec building, other structures include a four-car garage, a cottage-like building next to the rec building that could be used as a workshop, storage shed or art studio, and a huge ag barn that could be used as is as an equipment barn or could be transformed to suit your needs. At one end of the barn, there is a large workshop with plenty of space to use for hobbies or storage. 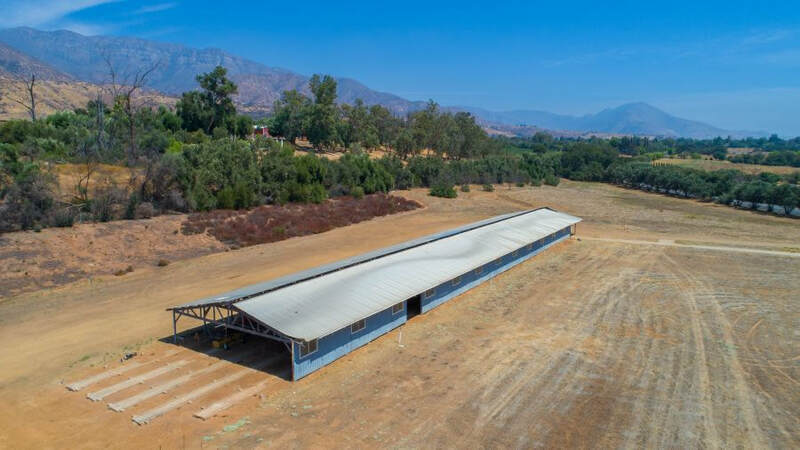 The barn itself is the last remnant of Paradise Ranch’s chicken and egg farming days and is a huge, open, covered space that could be used as an equipment barn, ag barn or covered parking for retreats, or it could be transformed into an event space. The barn is located in a large, flat field, which could be used for outdoor activities or horse facilities with plenty of room for trailer parking for shows or riding clinics. 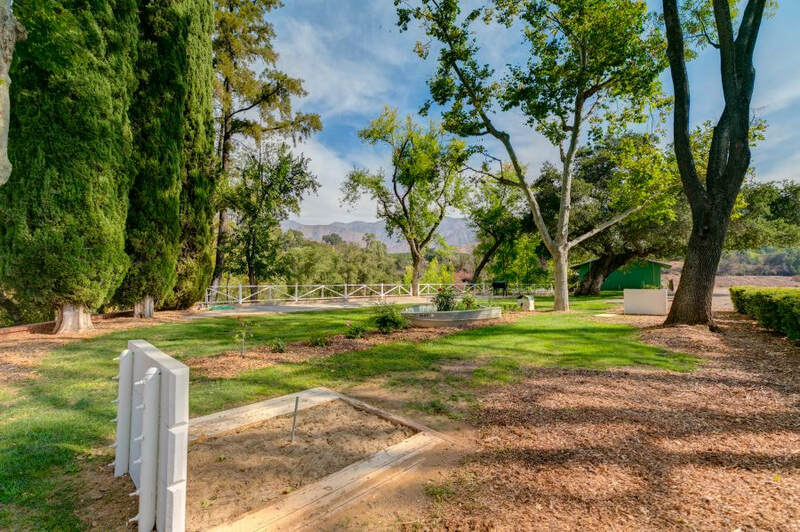 Of course, this is also one of the areas on this 36-acre property that would be great for ag use, such as running cattle or growing lavender, a vineyard, an orchard, or produce to sell at the weekly farmers market in Ojai. As an added bonus, there is already a Casitas Water District ag meter in place.